Well, it’s official. I live in New York City. I live in New York City! Gah. After a week of all that comes with moving – battling with bubble wrap, struggling to carry boxes down the stairs and load them into a moving truck, gripping the wheel of said moving truck as it clumsily hums down I-95, bruising body parts while unloading piles of junk from the truck and, finally, unpacking piles of junk into some semblance of a place where someone might live – I’m not sure I can still write in cohesive sentences. I guess we’ll find out. I know you probably want to hear more about the shelving, but I’d like to jump straight to the halibut. You know… just for the halibut. (Heyoo! …Sorry.) I had a wonderful group of girls over on Sunday night to help break in my new kitchen, and I’m happy to say that Jane Bursky’s halibut with tomatoes and spinach was my very first home-cooked meal in The Big Apple. At least, it would have been if the supermarket wasn’t out of halibut. 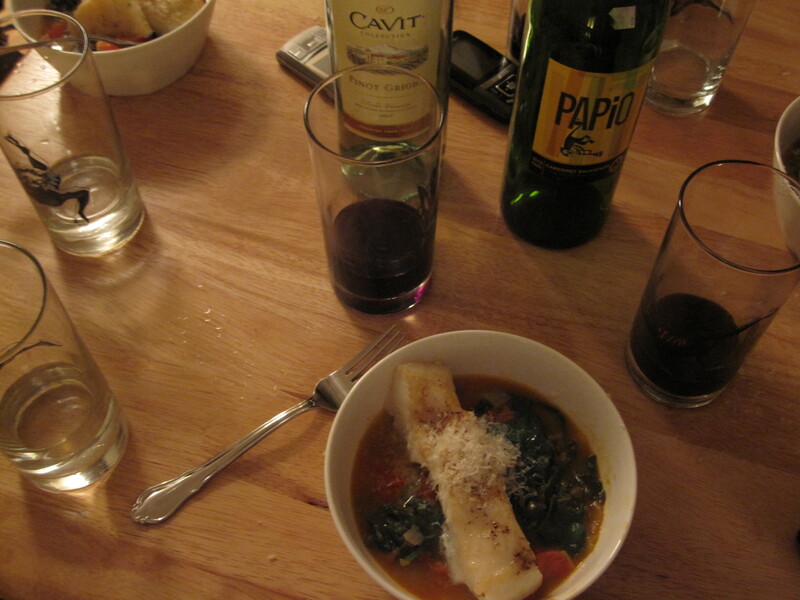 We used Chilean sea bass instead, and we ate it while drinking wine from water glasses (apparently wine glasses were the one thing I forgot to buy at “Bed and Bath”), sitting in mismatched chairs around the tiny table in my brand new studio apartment, and I must say it was the best first New York meal I could hope for. Though Chilean sea bass isn’t as conducive to clever puns as halibut (just for the… chilean sea bass? ), it works beautifully in this dish, surrounded by a thick broth of onions, tomatoes, spinach and white wine. And friends like KGB, KGro, JBursk and Coface. If my first homemade meal is any indication, I think I’m going to like New York. *I know this sounds like a lot of tomatoes. It is. But trust me, in this dish, when it comes to tomatoes, the more the merrier. Heat the olive oil in large skillet over medium heat. Add onions and cook until lightly browned, then add the minced garlic and cook about 30 seconds more until garlic begins to turn golden. Add all but a cup of the tomatoes, capers and white wine, simmering until the liquid is reduced almost in half. Add the rest of the tomatoes and the spinach in bunches, turning with tongs to incorporate into the sauce. If the sauce seems dry, add a bit more olive oil. Reduce heat (almost until the burner is off – you just want to keep the sauce hot). Next, brush the fish on both sides with olive oil, and season with salt and pepper. In another pan (I used a grill pan), saute the sea bass for about 4-5 minutes per side, or until the fish turns opaque. Spoon sauce into the bottom of a bowl or deep plate, and top with the fish. Serve immediately, letting guests sprinkle parmesan on top to taste. Serves 4, with extra sauce (which would also be fabulous on pasta or chicken). SUCH A GREAT FIRST MEAL MOLLS! Can’t wait for many, many more together! …just for the halibut. holler. oh my….i didn’t know i was famous!!! I ADORE your blog, and you know i LOVED your brownies…..made them a few weeks ago! Keep up the good work, Molly! and welcome to New York!!! !